A book fair with a huge range of fiction and nonfiction titles available! Stock up on books for winter reading. Support Rotary to support your community! We are always on the look-out for any TEC courses that we think the Deaf community may benefit from. 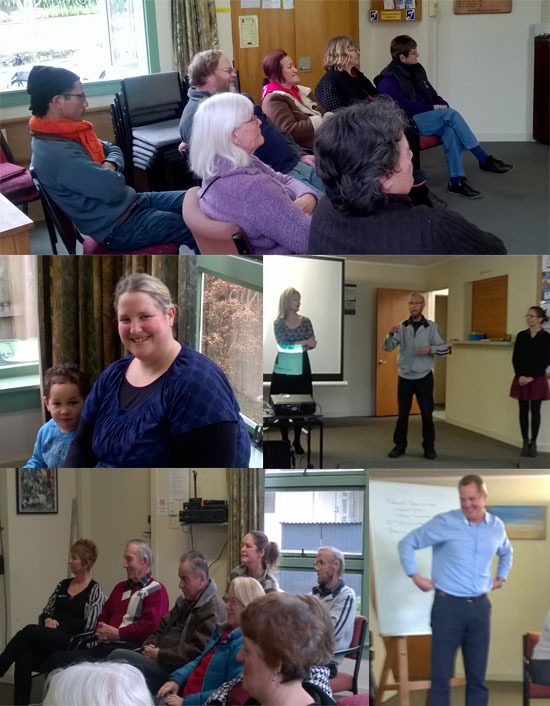 In the past year, we have had a Super Nutrition, Forklifting, Maori, Tech Smart for Senior Citizens, Tinnitus Support Group, and an RTW Licence Endorsement course available for the community. 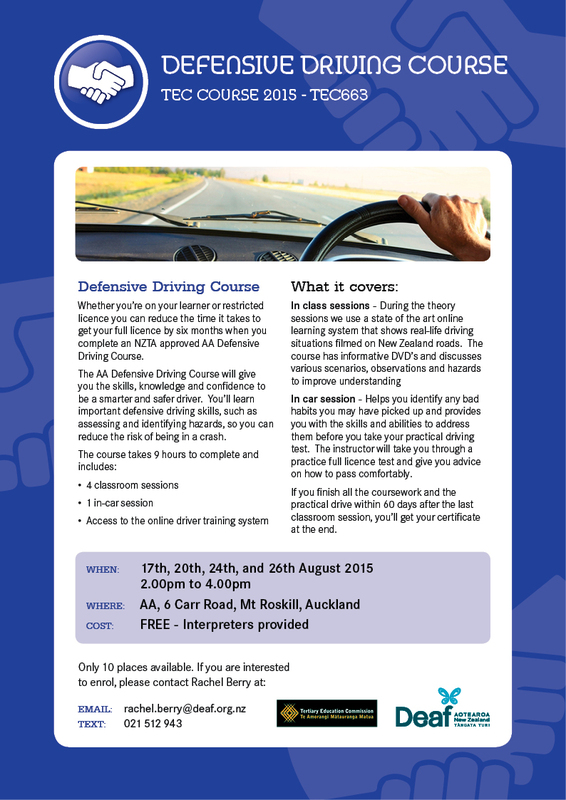 Coming up is the Defensive Driving Course. We try our best to meet the community’s needs, but it is not always possible if we do not know what you want. If you have ideas for future courses that we can make available to you then please do let us know. All learners must be aged 16 years or older. 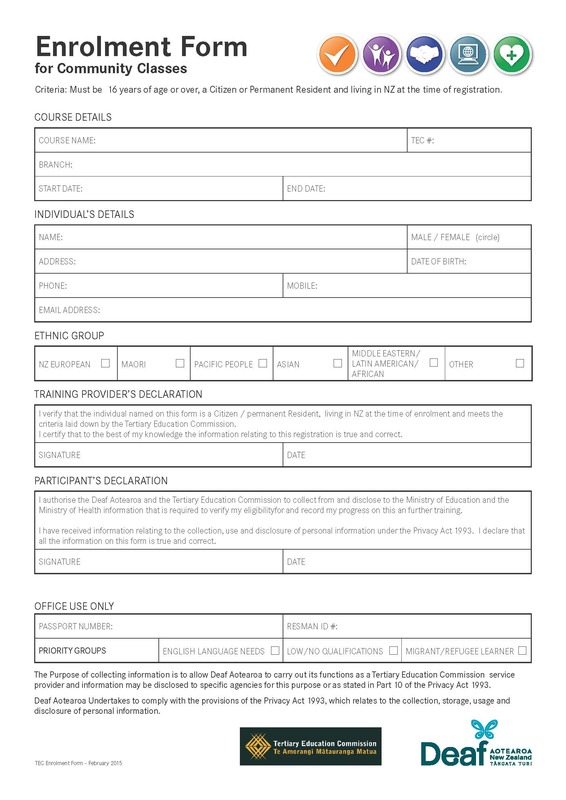 All learners must be a New Zealand Citizen, or a Permanent Resident, currently living in New Zealand. All learners must not be enrolled in secondary school full time. TEC cannot be used to teach hobbies. If you have any ideas, or want to check if a particular course can be made available to you by Deaf Aotearoa, please contact Rachel Berry. The deaf club will be open on Saturday for everyone who wants to watch the All Blacks play against the Wallabies! The rugby kicks off at 10:05pm. The bar will be open at 9pm with sign café. A reminder – Stir It Up is on again this Saturday! Come along and attend our monthly casual cuppa. 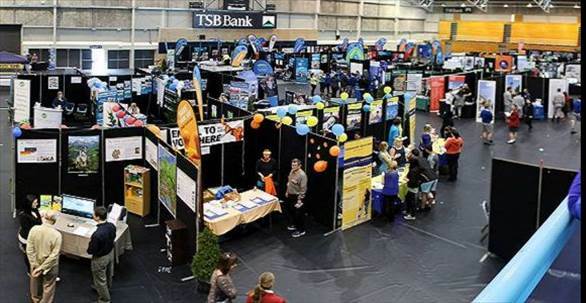 A great setting for First Sign families, NZSL students, whanau and/or friends for all ages! Where: Deaf Aotearoa South Auckland office, Level 1, Westfield Mall, Manukau. 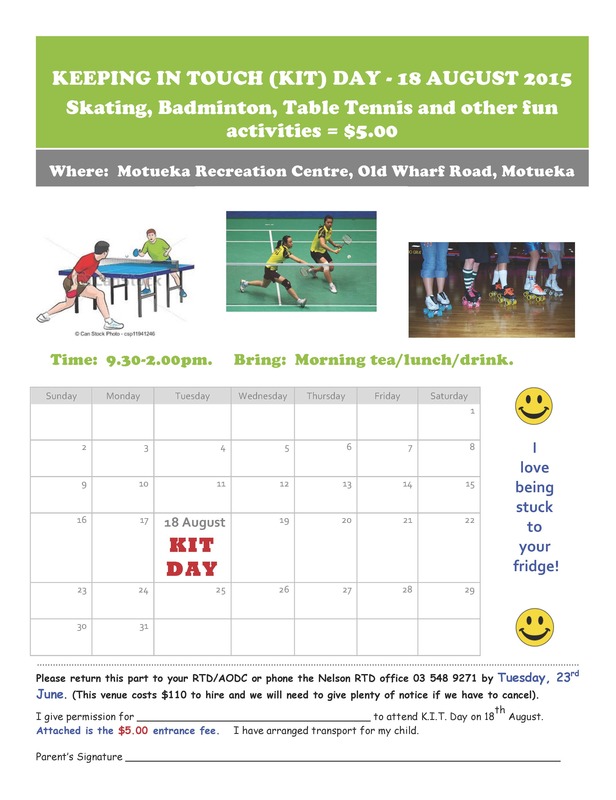 For more information, please contact Natasha Cloete. 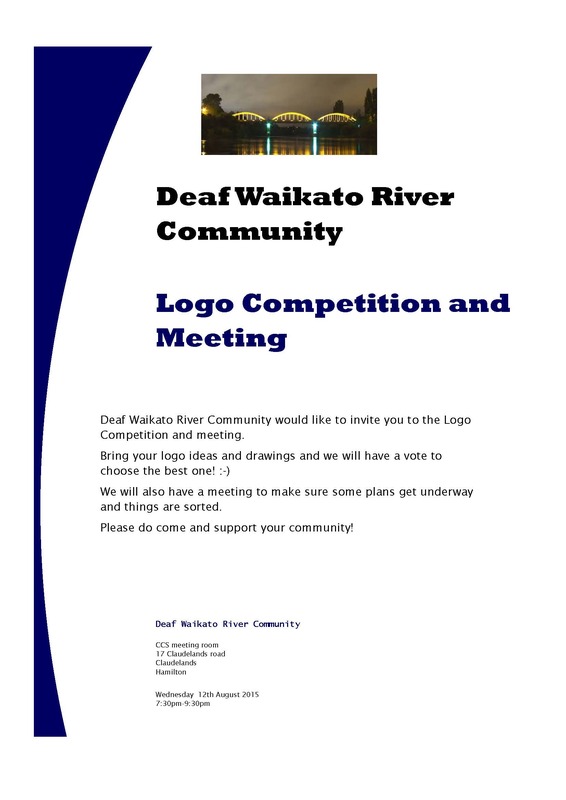 Deaf Waikato River Community would like to invite you to the Logo Competition and Meeting. Bring your logo ideas and drawings and we will have a vote to choose the best one! 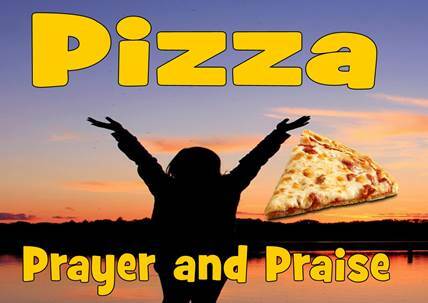 We will also have a meeting to make sure some plans get underway and things are sorted. Please do come and support our community! Three day timetable or five day timetable? 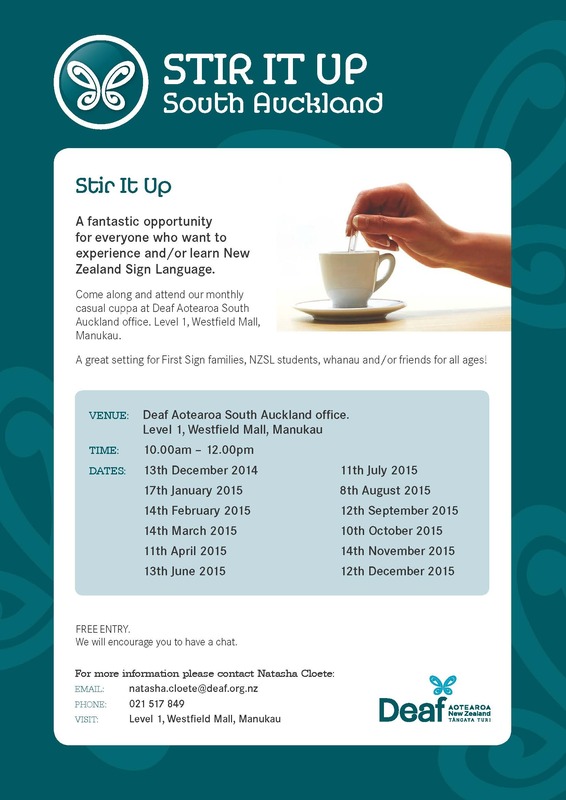 Come along to the August “Stir It Up” to have a chat and a relaxed, social catch up. 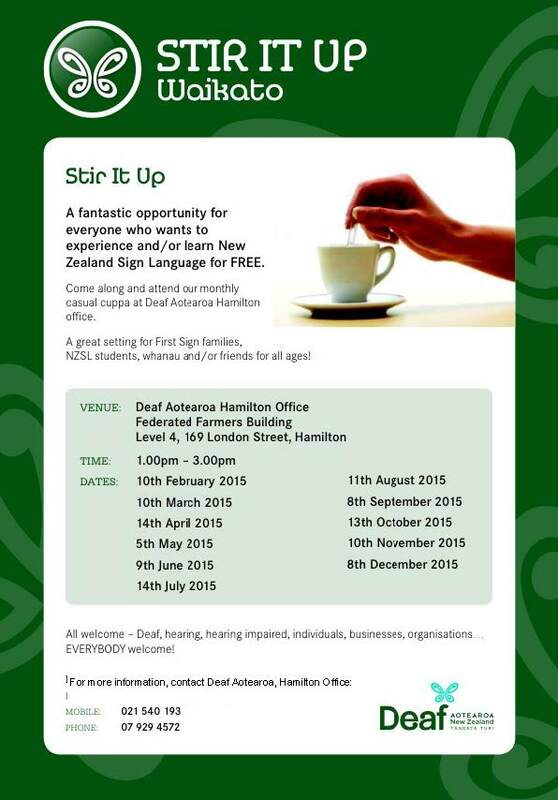 It could be an opportunity to teach people some NZSL, and meet a new staff member at the Hamilton Office! All welcome – Deaf, hearing, Hard of Hearing. Afternoon tea, coffee and tea provided. 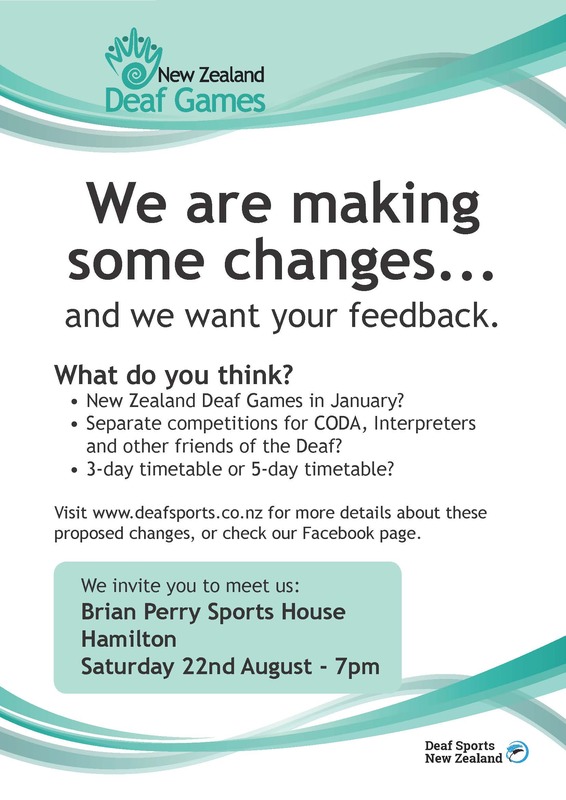 Please note some important August dates for the Hamilton Deaf Aotearoa Office. 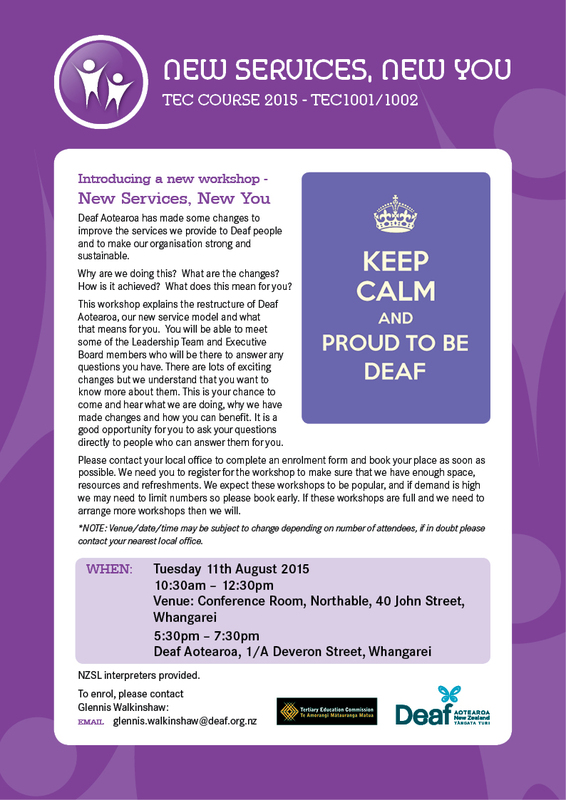 From Monday 17th of August – Friday 28th of August, there will be some exciting building and changes happening in the Hamilton Deaf Aotearoa office. During this time, there may be some changes in office opening hours, and limited access to the community computer. 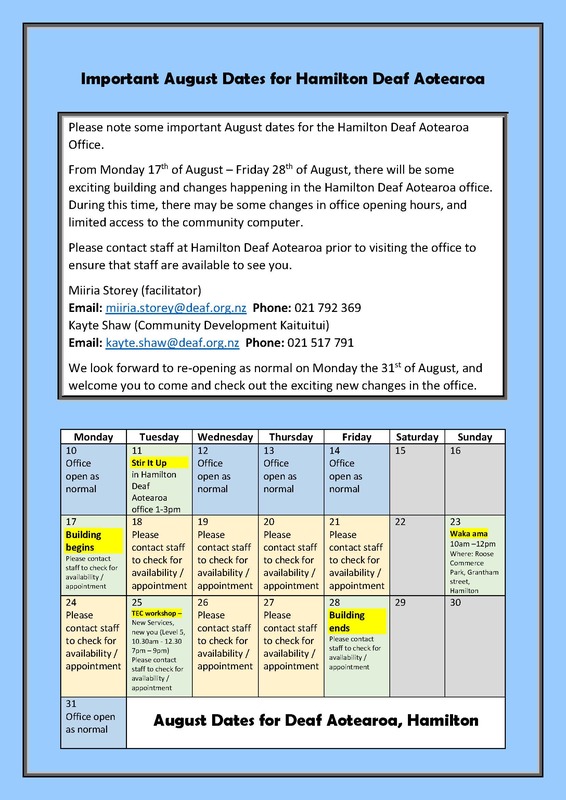 Please contact staff at Hamilton Deaf Aotearoa prior to visiting the office to ensure that staff are available to see you. We look forward to re-opening as normal on Monday the 31st of August, and welcome you to come and check out the exciting new changes in the office. 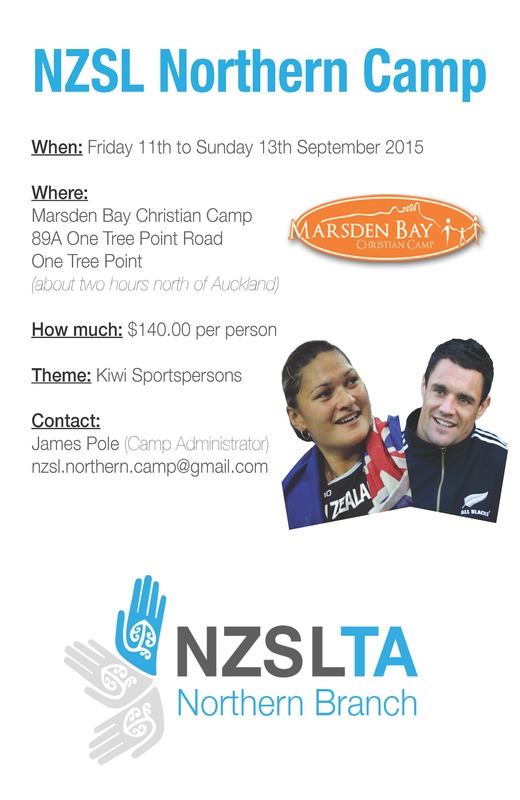 New Zealand Sign Language class students, are you interested to join the NZSL Northern Camp in September? 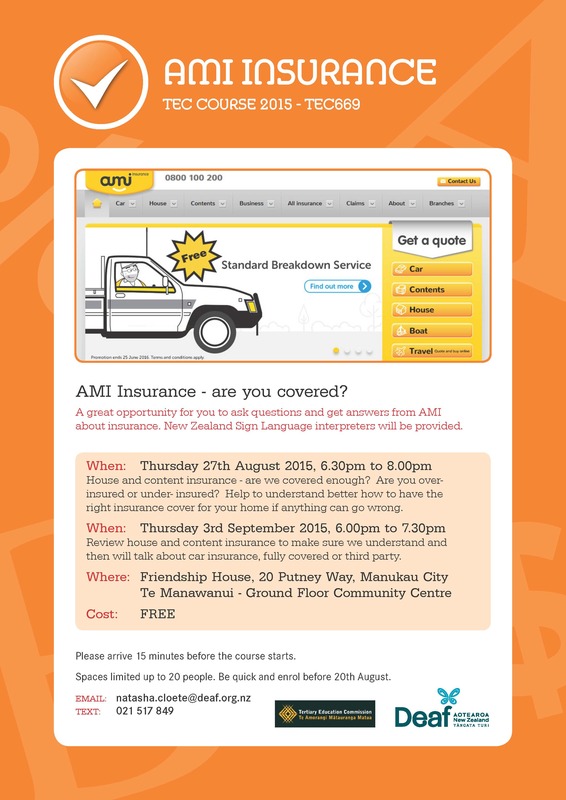 For more information, contact details and/or to book your name, click on the flyer. This is once in a lifetime opportunity to watch our Tall Ferns take on Australia – Opals on our home soil in the most important game in the four year Olympic cycle. There is a mixture of players who will go head to head with the world number two Opals. This game will also serve the qualifier for the Rio 2016 Olympic Games. Go down to the game, wear black, cheer on our teams and be a part of history. There will be a Fun Day for the family with so much to do at the given address above. Click on flyer for all the information. Thousands of people will be joining forces with their spatulas to help raise funds for Tauranga SPCA on Monday 24 August. Get your spatula working, bake some cupcakes and sell those cupcakes! There will be cupcake baking competitions for kids club members, teenagers and adults so why not make a day of it? 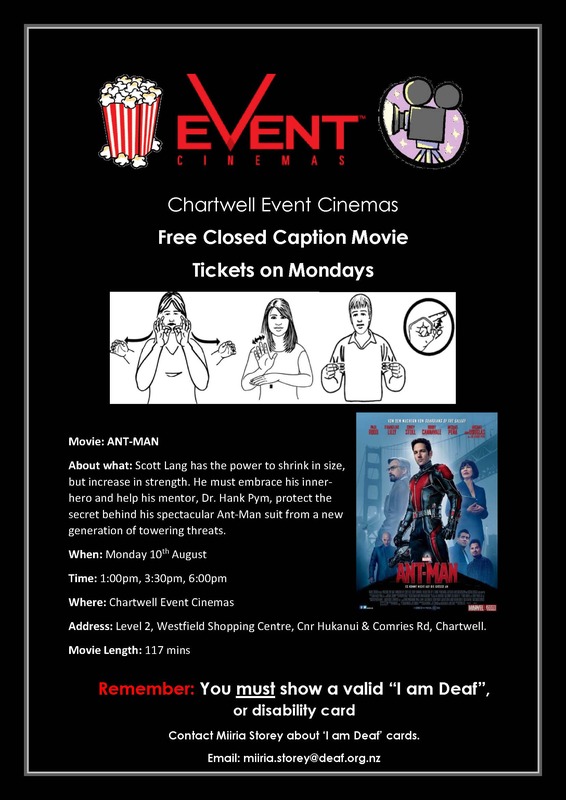 There will also be prizes up for grabs! 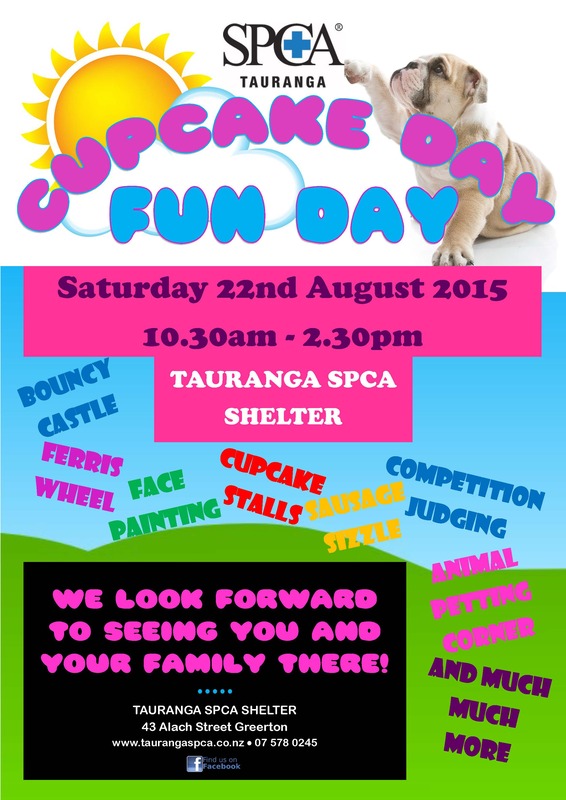 Help the animals in need with Tauranga SPCA. When will there be an interpreter in New Plymouth? Check with iSign first that the interpreter has not been cancelled and will still be in the Taranaki region on your booking date. 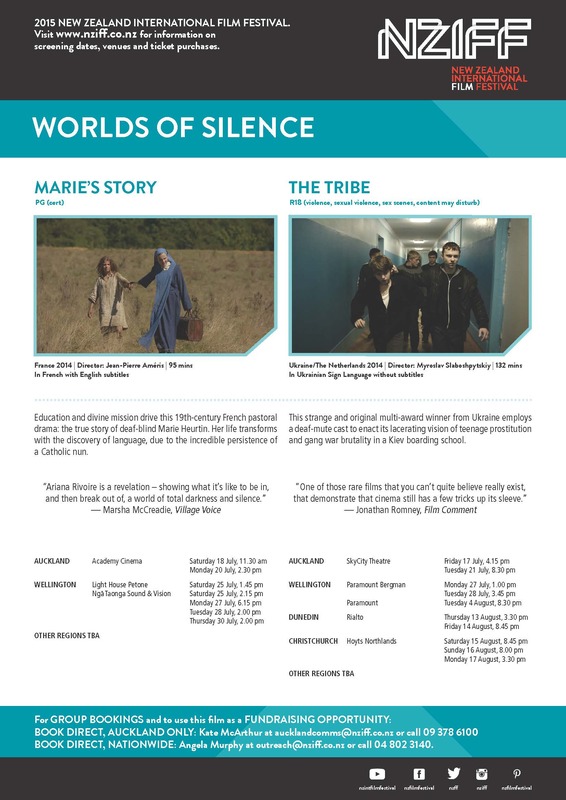 This year NZIFF have two films that have been of considerable interest to those in the Deaf community. This strange and original multi-award winner from Ukraine employs a deaf-mute cast to enact its lacerating vision of teenage prostitution and gang war brutality in a Kiev boarding school. NZIFF are delighted to give you the opportunity to come along yourself, use one of these films as a unique fundraising opportunity or attend as a group at a discounted price. NZIFF have a wonderful line up of films in all genres so stay on our mailing list for early release information on those too. A NZSL Interpreter will be there. Hawkes Bay is looking at combining Wairoa, Napier, Hastings, Waipawa and Waipukurau (Central Hawkes Bay) together into one council. Do you think this is a good idea? Many people are saying “yes” it’s a good idea. Many people are saying "no" it’s not a good idea. Voting papers will be sent out in the mail on August 24th and voting will close on September 15th at noon. 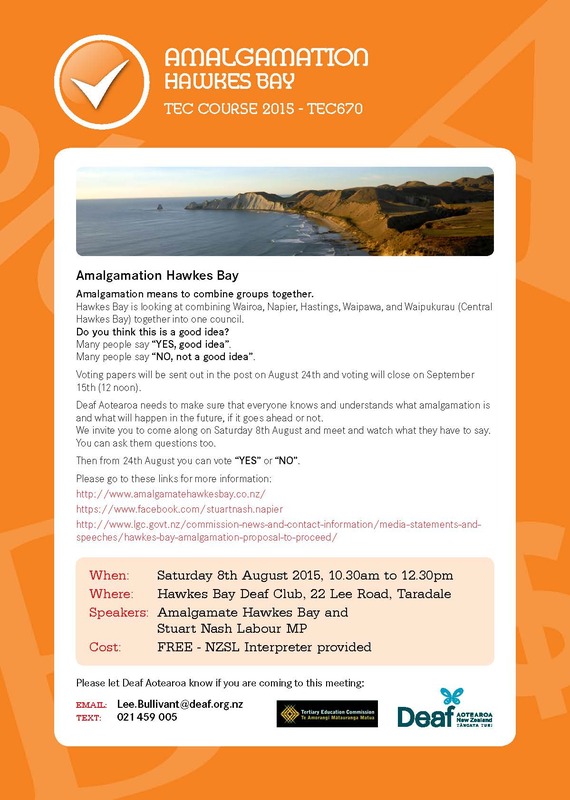 Deaf Aotearoa needs to make sure that everyone knows and understands what amalgamation means, and what could happen in the future if they choose to combine or not. We invite you to come along on Saturday 8th August and see what they have to say. You are most welcome to ask them questions too. Then from 24th August you can vote "yes" or "no." Please let Deaf Aotearoa know if you are coming to this meeting. Please check out the official flyer for more information and please mark this on your calendar. Catch up with Deaf community members. Catch up with news from Deaf Clubs/ societies and around the world. Catch up about Deaf Sports. Talk about setting up a Deaf Sport group as well as fun activities, games etc. The new cycle lane begins in Dixon Street and connects with shared cycle and walking path in Karo Drive and through Pukeahu National War Memorial Park. This is to improve cycling infrastructure safer. City Council will monitor to see how well it works. Can go to WCC website to get more information and leave feedback. Check out the photos from Nelson's New Services, New You workshops which took place on Monday 3rd July! 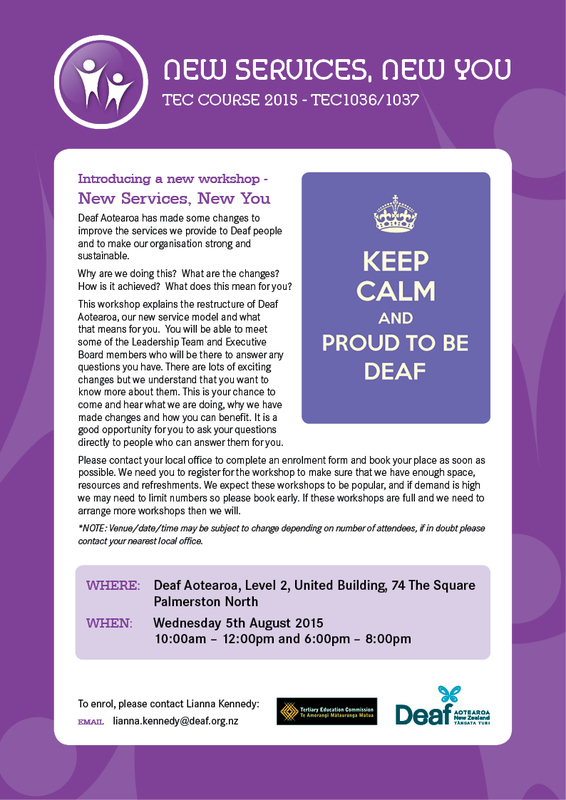 Please come along and chat with the Deaf community, all welcome. The last few months our group have more new members who joined us, everyone enjoyed the group and learning new skills and we are always welcome new people to join us! You, your family or friends are most welcome to join our group to learn new skills, projects or finish off your project and we will be there if need support with your project. Please bring a plate to share for lunch, your project, eg knitting, crochet, quilt, sewing or anything you want to work on and gold coins for hot drinks, thank you. Remember the Arts Centre Market? Many of our stall holders and ethnic food caravans used to be at the Arts Centre on weekends, and now they are relishing the opportunity to start again on a regular basis, especially as it's in the central city. Where: 100 Peterborough St, opposite Peterborough Central Library. "Otago Deaf Society Incorporated Annual General Meeting"
Where: McNab Reading Room, Third Floor, Dunedin Public Library, The Octagon. Guest speaker is Dr Warren Forster from ACClaim Otago on their recent report to the UN on access to justice for injury disabled people.